Chicago, IL-based Viskase supplies cellulose, fibrous, and plastic casings for the processed meat and poultry industries. The 85-year old company, which earns $300 million per year in revenue, employs over 1,300 people and manages manufacturing and distribution facilities in North America, South America, Europe and Asia. Protera Technologies designed and implemented the solution and maintains the environment for Viskase. The synchronized disaster recovery system uses one Amazon Elastic Compute Cloud (Amazon EC2) instance and Amazon Virtual Private Cloud (Amazon VPC). When running tests to ensure the system produces expected results, Viskase provisions additional Amazon EC2 instances. The figure below provides a diagram of the implementation. Since implementing the AWS solution, Viskase improved its time to restore service from two days to less than an hour. The IT department expanded the disaster recovery solution to include all countries using their current SAP instance, which delivers a nearly 100 percent uptime commitment. “We will use AWS to distribute disaster recovery resources across multiple independent AWS regions to improve business continuity,” notes Ryzner. 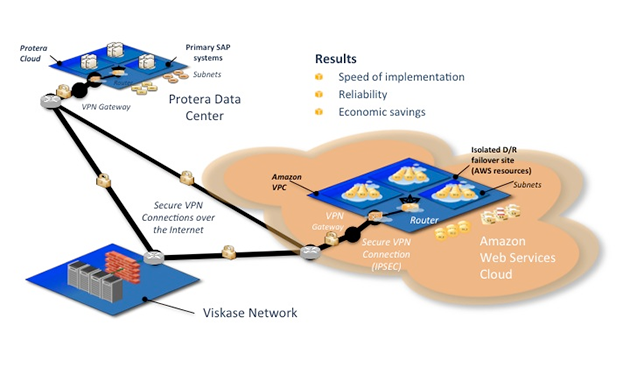 Looking ahead, Viskase plans to evaluate the AWS disaster recovery solution for South America. Viskase is also considering using AWS for its non-SAP systems, such as its Microsoft Windows Server platforms. To learn more about how AWS can help your backup and disaster recovery needs, visit our Disaster Recovery details page: http://aws.amazon.com/disaster-recovery/. For more information about how Protera can help your company run on the AWS Cloud, see Protera's listing in the AWS Partner Directory.